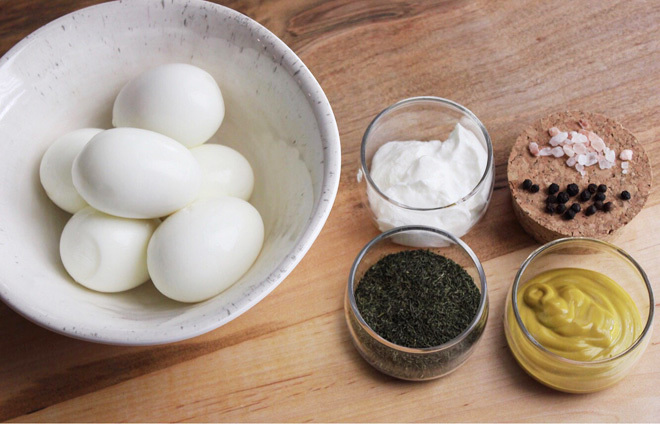 Do you want to know my secret recipe for the easiest, fastest, high-protein lunch ever? 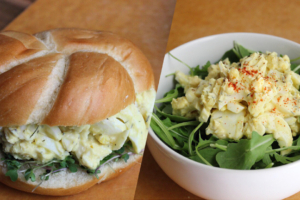 Greek yogurt egg salad to the rescue! I can’t tell you how often this dish saves me when we have nothing for lunches and are trying to avoid eating out or save money. It requires less than 6 ingredients, usually all of which I have on hand. Even better, it takes less than 5 minutes to make if you already have hard-boiled eggs prepared. If you don’t, it still won’t take more than 20 minutes tops. It is also extremely versatile in that you can add in crunch, take away ingredients, or change spices to your liking and the integrity of the dish remains intact. To be honest, it’s not even much of a “recipe” in that I usually just eyeball how much of each ingredient I use, tasting along the way until I’ve got the right ratio down. It is for sure what I consider a “back-pocket” meal though; i.e. one of those meals that you can practically make in your sleep, is tasty, and fits the bill for nutrition too. 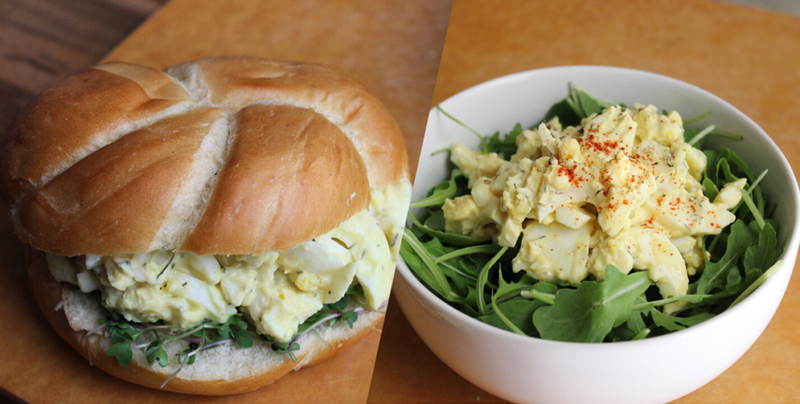 The secret ingredient here is replacing your typical mayo in egg salad for Greek yogurt instead. It seriously amps up the protein content, and I swear that you cannot tell a difference in taste. It is simple, delicious, satisfying, and a go-to staple that you should add to your repertoire in the kitchen ASAP. Chop or slice your hard boiled eggs into a bowl. Add Greek yogurt, mustard, and dill. Mix together until all of the egg is coated in the dressing, but not so much that the eggs get smashed. Enjoy on toast, over a bed of greens, or by itself. Optional add-in ideas include: diced carrots, celery, radish, or other crunchy vegetable; chopped pickle or relish; diced tomatoes; red pepper flake or paprika.